Patients undergoing treatment for cancer and other diseases often find that they can no longer enjoy food. In fact, for many, sitting down to a meal becomes a horrific parade of dishes that taste like sawdust or metal. Unfortunately, that same tasteless food is still needed for nourishment and strength. And, enjoying the chance to share a meal with family and friends is considered essential in the healing process. Chemotherapy, by necessity, kills off fast-growing cells, which unfortunately includes receptors for taste and smell. Dan Han, a neuropsychologist at the University of Kentucky in Lexington, believed that quality of life should also be a measure as clinical outcomes for patients. He talked with Chef Fred Morin, a bioengineer by training and owner of Joe Beef in Montreal, Canada, about the possibility of merging science and culinary training to study the brain and behavior that influences the food experience. The result of this collaboration was the first annual International Society of Neurogastronomy Symposium at the University of Kentucky. Present were 200 scientists, patients, and chefs who gathered to explore issues of quality of life for people who had lost their perception of smell and taste due to illness and treatment. Offering TED-style talks were chefs Fred Morin and Jehangir Mehta ’95, owner of Mehtaphor and Graffiti in New York City; Yale neuroscientist Gordon Shepherd; and experimental psychologist Charles Spence, to name a few. Participants at the event were encouraged to visit eight tasting stations and—with the help of blindfolds, scent jars, and nose pincers—discover how more than one sense was involved in the perception of flavor. This fact opens doors to helping patients enjoy food using different stimuli and was the focus of a fun and informative challenge. 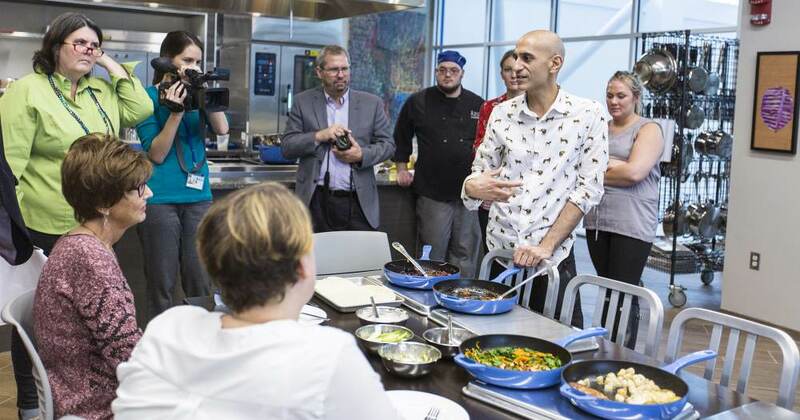 During the Applied Neurogastronomy Challenge, teams of chefs, neuroscientists, and physicians competed to create a meal that would appeal to two chemotherapy patients who had lost their sense of taste. One of the women will be having chemotherapy for the rest of her life. Chef Mehta’s team offered up peppered scallops, grilled chicken, and mustard-lime halibut to be paired with chili jam, apple goji reduction, lemon-marinated apples, carrot yogurt salsa, or a chocolate chili mole. Chef Morin’s team prepared chunky potato soup with customized toppings including diced potato and bacon, pulled chicken and ginger, garlic broccoli, and free-range chicken skin with paprika. Both chefs offered mix-and-match alternatives to maximize taste options. The winner that day was Chef Morin’s soup, but the true winner was the knowledge gained about how we need to change the way we cook so that patients’ senses are engaged when eating, making for a more nourishing and fulfilling experience.